Chalkboard paint offers endless options for creative expression. From toys to home entertaining items, there are lots of fun projects that utilize this inspiring craft paint. Try some of these ideas to get started. 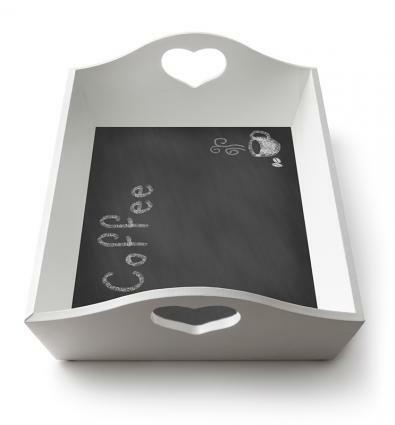 A tray is the ideal choice for chalkboard decorating since the surface is flat and easy to paint. Once you've painted the surface, you can label the tray with information about what you're serving. This would be perfect for a wine and cheese party or other event with multiple dishes. This makes a great beginner project. Choose a wood tray with a nice smooth surface to help the paint adhere and to make sure the finished chalkboard is easy to wipe clean. Expect to spend about an hour creating the tray, although it will require additional time for drying. Begin by sanding the bottom of the tray to ensure a totally smooth surface. Use a damp cloth to wipe off any dust. Apply painter's tape along the vertical sides on the interior of the tray. Keep the edge of the tape in line with the corners where the tray sides meet the bottom. Use your fingernail to make sure the tape adheres well. Pour some primer into a container. Dip a foam brush in the primer and apply the primer evenly to the edges of the tray's interior bottom. Then pour primer into a roller tray and use a small foam roller to evenly prime the interior bottom of the tray. Allow the primer to dry according to the product instructions. Pour chalkboard paint into a container and use a brush to apply it to the edges of the primed surface. Use a foam roller to cover the interior bottom of the tray evenly. Add at least one more coat of chalkboard paint, allowing drying time as directed on the product. Allow the tray to dry for 24 hours. 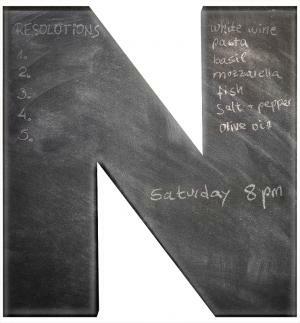 Use a piece of chalk to "prime" the chalkboard. With the chalk on its side, rub it over the entire surface. Erase with a damp cloth. You can turn an old puzzle into a useful chalkboard, simply by applying a bit of paint. This is a great project to do with kids, although it can get messy. The amount of time this project will take depends on the size of the puzzle but it is an easy beginner option. 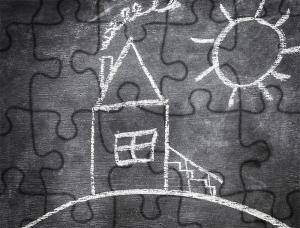 If you'll be working with kids, it may be best to start with a small puzzle. Choose a puzzle with few pieces since putting it together when it is painted will be more challenging. Spread a plastic sheet or garbage bag on your work surface to protect it from paint. Take the puzzle pieces apart and place them on the plastic. Very lightly sand each piece. You want to barely rough up the surface so the paint with adhere, but you should avoid damaging the paper. Wipe each piece with a damp cloth to get rid of any dust. Use a foam brush to apply paint to each piece. Pay special attention to the edges as well as the top surface. Add another coat if you feel you need it. Allow the pieces to dry for 24 hours. Assemble the puzzle. "Prime" the chalkboard puzzle by rubbing the entire surface with the side of a piece of chalk. Erase with a dry cloth. When you host a party, it's easy for guests to get confused about which glass is theirs. 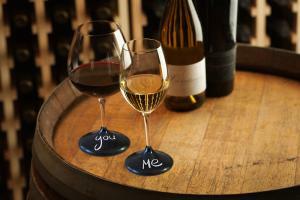 These chalkboard-painted wine glasses solve that problem in an adorable way; guests can simply write their names on the glass bases to eliminate the confusion. Because painting on glass is a little trickier than some other materials, it's best if you have a bit of previous chalkboard painting experience. A set of four glasses will take you about an hour, plus drying time. Remember that you will need to hand wash the finished glasses to protect the paint surface. Wipe the glasses with the rubbing alcohol to remove any oils or residues on the surface. Allow the alcohol to air dry. Place a piece of painter's tape around the stem of each glass at the location you desire the chalkboard paint to end. Use your fingernail to make sure the edge seals well. Apply a thin coating of glass primer to the base of each glass. Allow the primer to dry completely. Apply two coats of chalkboard paint to the base of each glass. Try to minimize brush strokes as much as possible. Allow the paint to dry for at least 24 hours. "Prime" each chalkboard section by rubbing it with chalk and then erasing it with a damp cloth. You can create a personalized chalkboard for a lucky recipient with this easy craft. Bundle it with some multi-colored chalk for a fun gift. This is an enjoyable project that is perfect for any skill level. It takes about half an hour, plus drying time. Spray paint makes it simple to get an even surface. Working in a well-ventilated area, apply an even coat of spray primer to the letter. Allow this to dry according to the package instructions. Once the primer is dry, apply a thin coat of chalkboard paint. Keep the can moving to prevent drips. You'll need to apply about three coats to get adequate coverage. Allow the paint to dry for 24 hours. When the paint is dry, "prime" the surface by rubbing chalk over it and then erasing the chalk. You can keep everything organized by applying chalkboard-painted labels to drawers, toy bins, and pantry containers. These labels start as regular stickers, so you can choose any shape you like. This project is easy. It takes only 15 minutes or so to paint a sheet of labels, although you'll also need to account for drying time. Protect your work surface by covering it in a garbage bag. Place the piece of cardboard on top. Tape the sheet of stickers to the cardboard. 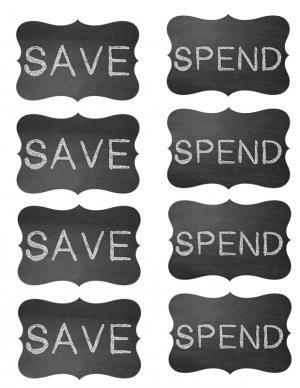 Use the foam brush to apply a thin coat of chalkboard paint to the surface of the stickers. Allow the paint to dry for a few minutes and then apply another coat. Allow the paint to dry completely. Drying times will vary depending on the thickness of the paint. Once the paint is dry, "prime" the labels by covering them in chalk and then erasing them. Peel the labels off the sheet and apply them to containers around your home. Use a razor knife to loosen the labels if they don't come off the sheet easily. If you enjoy using paint to create fun finishes, you'll love the many projects you can create with chalkboard paint. Experiment with different surfaces and methods as well as different types of projects. There's no limit to the creative possibilities.